Before you buy any shelving for your library, it's useful to consider certain product features, such as the type of shelving, the material and the dimensions. Thinking about these things will help you maximize both your space and book storage. The type of shelving you buy depends largely on the types of materials you need to display and the layout of your space. 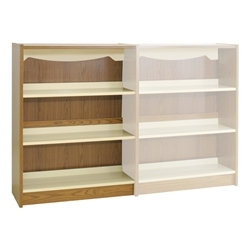 Bookcases can be single-faced, double-faced or sold as starter-units and adder-units. Single-faced cases have a back panel and shelves on one side. They work best up against walls in small spaces. Double-faced cases are divided by center panels to allow book storage on either side of the case. They fit best in the middle of a room, to allow enough space for aisles. A starter-unit can stand on its own but attaches to and supports coordinating adder units. You'll need at least one starter unit in a row of cases. An adder-unitcannot stand on its own, as it only has one side panel. It connects to a starter unit or other adder units to create customized, bulk shelving. 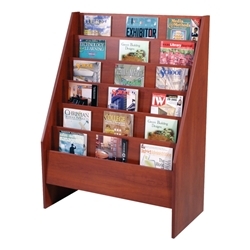 There are cases designed for oversized materials as well, such as dictionary stands, magazine racks, periodical displays and even atlas stands. Library shelves are most commonly made of solid hardwood, laminate or steel. Hardwood – Highly durable and resilient, can blend into just about décor. Laminate – Lightweight, easy to clean and affordable. Often available in different colors. Steel – Versatile and exceedingly strong. Excellent for heavy loads and lighter than wood. Remember, the lower the gauge, the stronger the steel. What material you choose often boils down to budget and style preference. Understanding the dimensions of your shelves and the media you need to display is key to maximizing your space. Shelf depth can range anywhere from six to 16 inches. Generally speaking, a shelf depth of 10 inches is the most common, and holds most paperback and large print books, as well as CDs and DVDs. Oversized materials such as newspapers, magazines and encyclopedias require shelf depth of at least 12 inches. Shelf height can range anywhere from 30 to 84 inches. Be sure your students can reach the top shelf of your units. Aisle width between shelves must be the minimum ADA requirement of 36 inches, although the ADA preferred with is 42 inches. Be sure to measure your space before you buy any shelving, keeping in mind the room's traffic patterns and furniture placements. Features such as adjustable shelves, casters and drawers make it possible to customize your space. Adjustable shelves and casters are especially useful if you plan on changing or moving your materials frequently.